I'm going to make two predictions for Week 17 in the NFL. First, the Oakland Raiders will defeat the San Diego Chargers. Second, the Kansas City Chiefs will knock off the Denver Broncos, which will hand the Raiders the AFC West crown and eliminate the Broncos from the playoffs altogether. Who will be the happiest guy in the world if those two things happen? 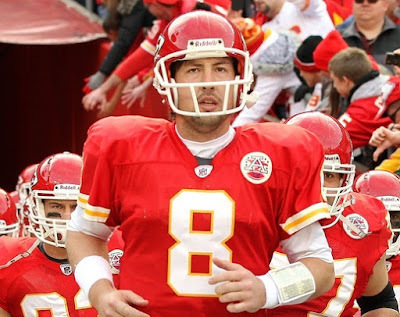 Kyle Orton, that's who. From the day he landed in Denver back in 2009, Orton found himself in a no-win situation. Jay Cutler, believed to be the quarterback of the future, was traded for him. A move that fans despised. Orton became the full-time starter that season and led the Broncos to a 6-0 start, but when they plummeted back to reality and finished 8-8, people wondered aloud if he was anything more than mediocre. The following year, Denver was awful. Orton and company went 3-10 together before he was benched in favor of rookie Tim Tebow after head coach Josh McDaniels was canned. John Fox came in and named Orton the starter for this season because he "gave the Broncos the best chance to win." While his rhetoric seemed flawed, it was understandable that he didn't want to replace veterans with young players at the risk of creating turmoil in the locker room. Denver came out of the gate at 1-4 with Orton under center, sitting last in the AFC West and showing no signs of life. Broncos fans constantly chanting "We want Tebow" finally won Fox over in Week 5 against the San Diego Chargers, and it became clear that Orton's days in Denver were numbered. After he was benched, Orton sat and sulked on the sideline, not talking to coaches or offering advice to Tebow. But really, who could blame him? He eventually demanded a trade and when none of the offers suited the team, they cut ties with him. He wanted nothing more than to go back to the Chicago Bears, the team that drafted him and who needed a quarterback after, ironically enough, Jay Cutler went down due to injury. Chicago was in line to make the playoffs then, and Orton hoped to help get them there. Instead, he was picked up by the Kansas City Chiefs, a team destined to finish dead last in the division. So, while Kansas City may not have been Orton's first choice, he now has a chance to exact revenge on Denver by beating them and possibly eliminating them from postseason contention. I think the Chargers will beat the Raiders, so that will end the drama right there. Tebow will get it done.